Keet: Welcome back to The Paperclip Show, the show where our two horribly menacing hosts kidnap famous Neopian characters and coerce them into spitting their most guarded secrets! Keet: Well, it's good to know that we didn't frighten everyone off with last week's dancing Branston episode! The Faerie Queen appears onstage holding a cloud Gelert by the scruff of its neck. Fyora: I already told you I would be here. There was no need to send this along to "kidnap" me. Sam: Had to. It's an essential part of the show. Fyora: *raises eyebrow* I see. And how essential was it for him to bring back a bag of Battle Dung with him? A bag, I might add, that he did not pay for. Keet: O.O THAT WAS MY PET! Sam: Pooooor Meg. Oh well! Let's get on with the show. The first question if you will, Keet. Sam: Okay, I'll do the first question then. Snakebitesally7 asks, "I know that your tower is invisible, but are the things inside invisible as well? Or do they just appear to hang in thin air to passerbys?" Fyora: As I was saying, it's quite a funny story. You see, back when I first opened the Tower, the structure was the only thing visible. The objects appeared to be hanging in the air as you said. I put off performing a spell to make everything in the Tower invisible as well because I enjoyed seeing people jumping up and down from a hundred feet below trying to grab items. Keet: Niiice. Sounds like something I would do. Fyora: Indeed. Well, that all changed one day when I had Taelia --the Snow Faerie, you know -- over for tea. She also found the people below most amusing, but when she pointed out to me that I wear only skirts and dresses, I made it so that everything in the Tower is unable to be seen from the outside as well. Sam: Ah. That must have been... embarrassing. Fyora: Quite. For the next few weeks I had to banish several people to the desert for parading around with signs saying "Fyora wears pink tights!" And Jhudora has never let me hear the end of it since. But you know what I say? She lives on a purple and green cloud at the edge of Faerieland, and I live in a Palace. I think I still win. Keet: Well... that was a most -- interesting story... next question! Janinekishi asks, "Why do you wear the same outfit every day?" Fyora: Oh you humans are so petty and materialistic. Fyora: All profits from the Hidden Tower are donated to various charities around Neopia, including several that benefit abandoned pets in the Pound who no one wants to adopt. Keet: True. But you should own at least one other dress, in case you spill something on the one you wear and you have to get it dry cleaned. Fyora: Only humans are clumsy enough to spill things on themselves. No Faerie soils themselves in such manner of awkwardness. Fyora: No. If I gave you one, I'd have to give everyone one. Which I could do, but I won't. Fyora: Because I said so. Keet and Sam: AND A PARTRIDGE IN A PEAR TREE! Keet: I'm surprised you admitted to all of that. Fyora: Ah well, over the course of several thousand years, even the Faerie Queen needs a little tweak here and there. Sam: Well, now that we're all sufficiently scarred, I think it's time for the final question of the show. Keet? Keet: Okay, this one is from us. Why do Jhudora and Illusen hate each other so much? A flaming clown runs past screaming. No one can hear Fyora's answer except the two hosts. Fyora: --And that's why they hate each other so much! Keet: I never knew. *grin* And neither do our readers. Sam: If we have any left. 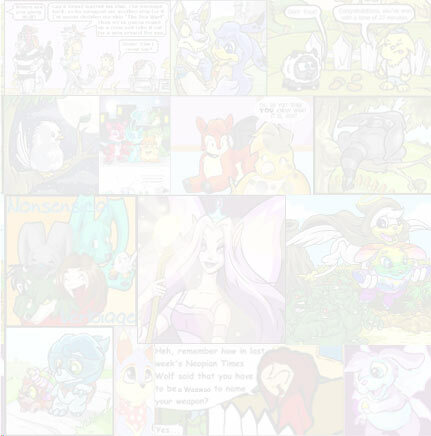 Keet: Well, thanks to all those who sent in questions, not to mention Fyora here for spilling her secrets. Sam: And Hika and Doodles, without whom this would not be possible! Fyora: Oh what a shame that would be. Keet: Shush. I think our guests enjoy the show far too much. Well, next week's guest is the Esophagor, so be sure to send in some really good questions for him! Sam: And by good we mean terribly embarrassing! Keet, Sam, and Fyora all wave as the lights fade out. When the light returns, they are gone. What good are they? All they do is ask you for expensive items and yell when you don't bring them back, right? Right? Wrong. 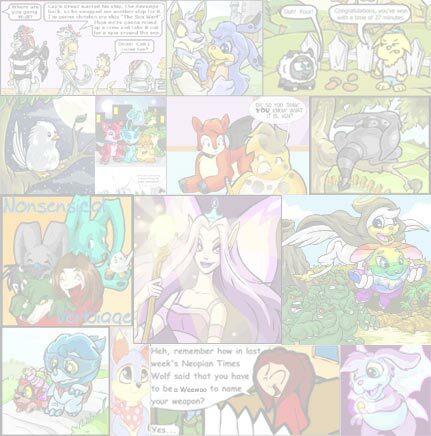 If you don’t have a lot of NP, are new to Neopets, or just want to see if you can find any more ways to make NP, then this article is for you. This week I'm going to talk about the other side of this calamity and who did the actual destroying in the destruction of Maraqua. You've seen them, marvelled at them, and wished you owned them. I'm talking about those castles, towers, palaces, and in general amazing residences you see everywhere in Neopia.